Mod The Sims - A fix for Wings3D Exploding meshes. A fix for Wings3D Exploding meshes. Replies: 25 (Who? ), Viewed: 32417 times. If you are anything like me, then you probably hate to edit meshes in milkshape. And, if you tried using Wings3D when doing the "Tutorial: MTS2 Mesh Tool Clothing (now with pics)" tutorial and the model looked as it exploded inside Sims then you can give this little application a try. I did not make a compleate setup for the app, I just put the exe in a zip archive. You must of course have the .NET framework installed but if SimsPE works on your computer you allready have it so it should just be a matter of unzipping it and doubleclick it to run. I will make a proper setup when I get the time. Using this app should also mean less problem with the normals as the original normals are 'reused'. In some case though, if say a dress has been edited and a vertice is moved a new averaged normal would have been better for just that vertice. However, reusing the normals is alot better than importing bad normals for all vertices. If needed I might add options for how to handle the normals later on. You should at least use Wings3D version 0.98.26b. The application might work together with other applications as well (if it does or not has to do with the precision of coordinates) so you can allways try it if you have problems with exploding meshes using another 3D application. Just a note - this will only work with MESHTOOL, use the MESHTOOL variation of the tutorial found here . With Meshtool you can only move vertices, do not add, delete, or do anything but 'move' them (scale and rotate are also fine). 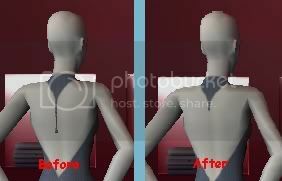 Also do not move the vertices past joints, or your sim will not animate well in the game. When you get to step 29 (just before the import if you want to use my recommended import settings) in the tutorial. Run the applications 'Create remap file' command and follow the instructions. When your done with step 31 (just befor the export if you did use my recommended settings). Run the 'Remap vertices' command and follow the instructions before you continue. Last edited by HellBorn : 18th Apr 2005 at 8:17 AM. Thanks! I will try it! I also gave up clothing, but I love Wings. Now I will try again! Dont' forget to press the Thanks button. Thanks! Don't include my content (in lots, sims...) but to MTS2, including a link to my thread. I keep getting something that says "key aready exists", and "shold not happen to the welded file? Aborting!" comes up also. What does this mean? Having some problems. I followed a tutorial to the letter but when I went to see the mesh in Bodyshop the head was normal but the body was lying on the floor. I also used this Vertical Mapper. As stated by Tiggerypum's edit in the first post, Wings 3D can only be used to do Meshtool edits to Body Shop meshes - that is, generally minor edits like fatter/skinnier bodies and slight lengthening/shortening of some things. I would not tend to recommend it for use with hair meshes as you cannot change bone assignments in it, and hair heavily depends on correct bone assignments to animate properly. hey thanks... I did the tutorial and used the vertice mapper thank you thank you thank you thank you thank you! and did u create that app yourself?!!! Last edited by $RaMRoM$ : 20th Mar 2007 at 2:30 PM. Reason: want to ask a quistion! Maybe this is a silly question, but how can you import your file? If I click on file--> open, you must open a pdf-file, but my file is obj. I downloaded Vertice Mapper, but on the second step I don't know what to do. I can't find a little box or something. Please help me, I've got version 1.6.1.
well, where do u mean u cant import!? in Wings or The VMapper? This is something odd. I do not use Wings, but Wings does read and write obj files. I open at by file--> open. Or is there an other way to open that file? That's not Wings. You're reading the WINGS MANUAL with Adobe Acrobat. Look at the filename across the top. You need to run the actual program. Can you tell me where you exactly can download it? Because on http://www.wings3d.com/ I don't know where I have to click. Okay, so you have a manual that's supposed to teach you how to use it. Last edited by $RaMRoM$ : 30th Apr 2007 at 12:51 PM. I'm having trouble with this, it says that 'key dont exist. the key from the orginal file was not found among the new keys. Aborting!'. I don't have a clue to what happened, I followed the instructions from the beginning tutorial for making meshes. I don't like milkshape, and have learned wings 3d and blender. I hoping someone can help with this, since I'd really like to make things for my game. Thanks so much for this app. It was strange because after editing my mesh and exporting it from Wings 3d, meshtool was giving me some runtime error when I was trying to import my obj file. Then I used your mapper, and tried it again and voila! no error from meshtool and my mesh is working great! Thanks so much for this! 5) Then this is where it all goes wrong. It asks me to import the file I just created into the remapper. Now is this wanting me to import "body1_exported"? When I do click on that, that's when I get the "Key already exists" error prompt. Last night, I did these steps over and over and over again and yet I always got that prompt. So on step 4 I named it something totally different (like "shortdress1") then went on to step 5 and it worked fine. I've tried this today (naming it something complteley different) and I'm still getting these errors. So I don't know what I fianlly did last night to make it work. Fixing the vertice gives me no errors (and these errors are happening before I even edit anything). If I don't use this remapper, meshtool won't let me import my obj file (like after I've edited, saved and exported) because it says I'm missing the UV coordinates or something. I'm getting frustrated. If you see something I'm doing wrong, please let me know. I can't imagine what's going wrong. Last edited by WykydSyn : 19th Sep 2007 at 8:05 PM.